When nail polish is applied it masks the nail and creates a waterproof covering. Water can get in from all edges of the nail polish and create a fungal infection underneath. Sweat from under skin goes through the toenail and gets trapped as the nail polish blocks the moisture from leaving the nail. This can rot the toenail. This can be avoided if you paint your nails and then remove the nail polish the next day try and think of it like putting on make up and taking off later that day. 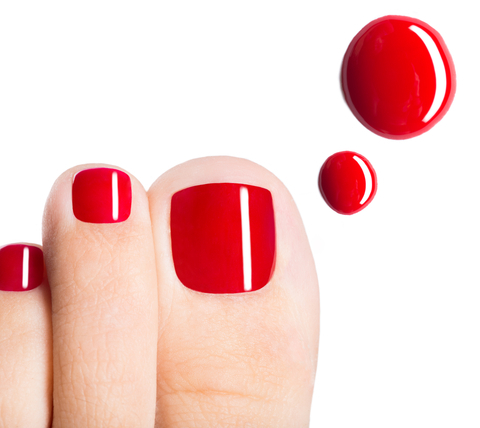 Nail polish is much harsher than make up so the effects on the toenail are much more severe. The nail polish should really only be used for the special event or during the day or the evening and removed later. Nail polish that stays on for longer is thought to be of better quality. Of course nail polish can look very nice but hygienically it’s actually not the best for the nails. By removing the nail polish the same day or the next day, it keeps the nails healthy and clean. Of course it’s nice to go for manicures and pedicures. Although everyone likes to keep the nail polish on for as long as possible it’s actually better to remove the next day. If the nails have been tidied and cleaned with a manicure and pedicure, it’s quite easy to paint the nail polish ourselves for a few times until the next professional manicure pedicure clean and tidy-up. Happy and healthy nails are easily achieved with nail polish when used like make- up. Take it off as soon as you can and enjoy wearing it while it is on.